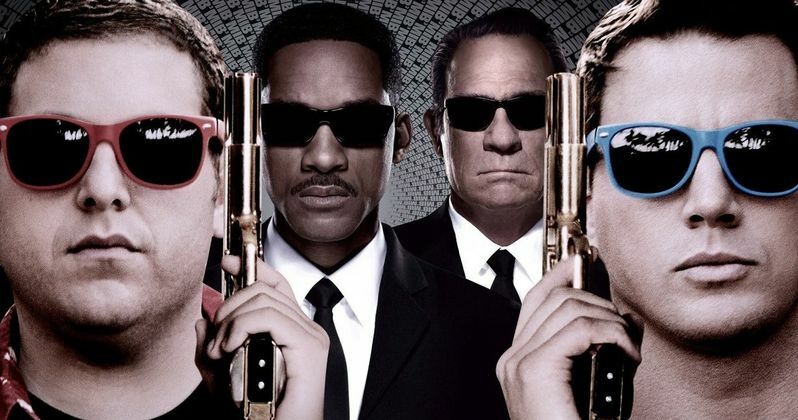 Back in December 2014, during the massive Sony hack, it was revealed through leaked emails that the studio is planning a crossover of two hit franchises, Jump Street and Men In Black. We haven't heard much about the project since last January, when 21 Jump Street and 22 Jump Street directors Phil Lord and Chris Miller revealed that the crossover is still possible. Today we have word from Variety that the crossover is actually moving forward, as the studio enters talks with director James Bobin to direct. Insiders claim that Sony hasn't officially issued a green light for the movie yet, but they are aiming to start production this summer. James Bobin was brought on because Phil Lord and Chris Miller won't be able to direct, since they're currently occupied with the Star Wars Anthology: Han Solo spinoff, which is set for release in May 2018. The filmmakers are still on board as producers, alongside Neal H. Moritz. Jump Street stars Channing Tatum and Jonah Hill are set to reprise their roles as Jenko and Schmidt in the 23 Jump Street and Men in Black crossover. However, original Men In Black stars Will Smith and Tommy Lee Jones as Agent J and K will probably not return. The studio is reportedly looking to reboot the Men In Black franchise with younger actors. 22 Jump Street writer Rodney Rothman penned the screenplay, which studio executives are pleased with, although no plot details have been made available. The studio is even keeping the script under lock and key, with the studio making agents drive out to the studio to read the script, to see if their clients have any interest in the project. If production does in fact start this summer, we may be hearing more about casting in the near future. James Bobin started his career on the small screen, serving as a writer, director and producer on shows such as Da Ali G Show and Flight of the Conchords. He made his feature directorial debut with The Muppets, and he most recently directed the upcoming Disney sequel Alice Through the Looking Glass, hitting theaters on May 27.